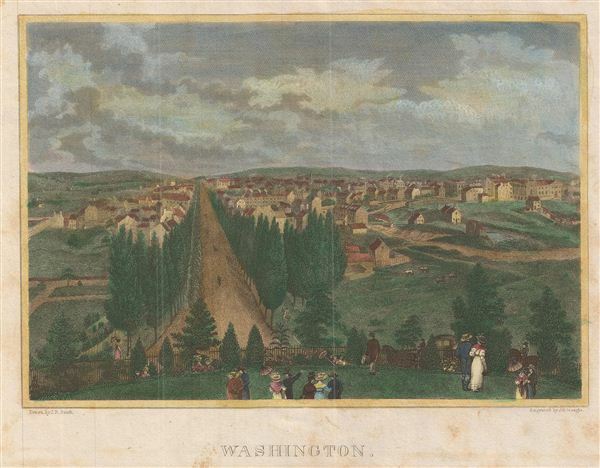 1828 Smith View of Washington D.C. This is an uncommon example of the 1828 view of Washington D. C. It features a lovely view of the city from what looks like a balcony. Not many buildings are visible; rather a grassy landscape is seen here. In the foreground, people are seen enjoying the view. This view was engraved by J. B. Neagle as part of Malte-Brun's System of Geography, Vol. I., published in New York by Samuel Walker.